Here’s a quick narrative battle report from a game Harry and I played last week as part of the Gamers Hub campaign. As he gazed at the Cygnaran force approaching MacBain tried to draw deep on his unlit cigar. He spat it out and bellowed orders at the unruly pirates while ensuring the furnaces of his Mule and Nomad were being lit. Some contracts just make sense; the risk is acceptable and the payout appropriate, but this wasn’t one. Between dealing with the slippery Cryxians and trying to get the Sa dog to to as he wished it had been a headache from the start. Now these Cygnarans, traditionally an ally, were approaching through this small village. 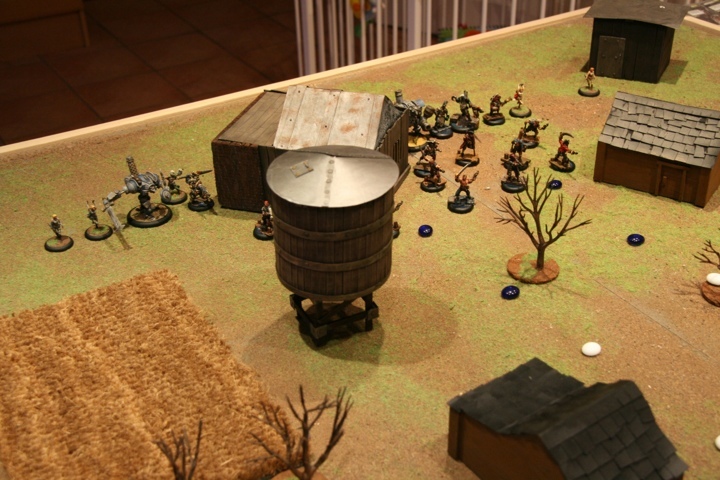 The villagers had abandoned it earlier in the day when the forces began to muster on its outskirts. A few coins to the village drunk indicated that a Warcaster on horseback was leading a ‘jack heavy force. This was not good news to MacBain. Kraye was not an enemy and this force of MacBain’s was not well suited to dealing with Cygnaran armour, but this is what he’d signed up for when he took the contract and this village is where he would make good on it. In a moment it erupted. 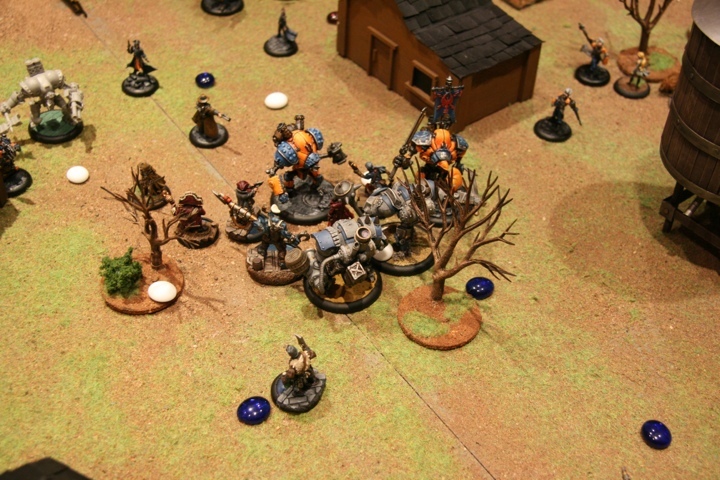 Shells from the Hunter warjacks slammed into the Mule while the Cygnaran heavies were hurtling towards their position. The pirates went from a rabble to a charging force of swords and pistols in seconds and began a noisy charge towards the enemy ‘jacks. A hail of enemy fire flew at them, but MacBain used his powers to protect the leading chargers and other key mercenaries in his force. 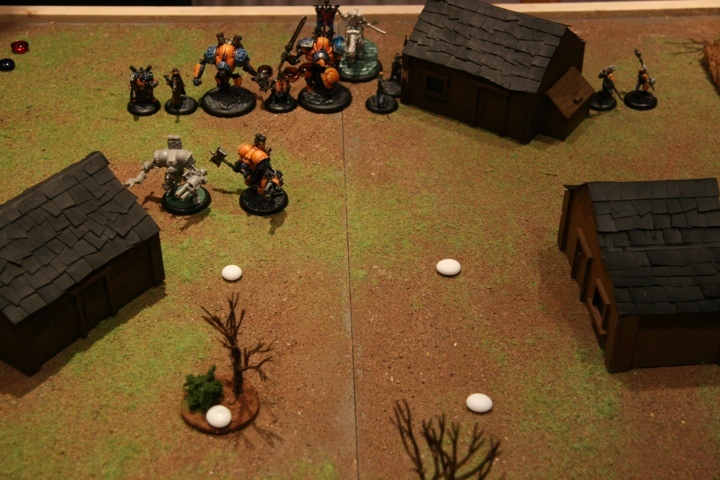 His ‘jacks moved forward, but were slowed by focussed fire and the disruptive powers of approaching Stormcallers. MacBain’s Khadoran assassins moved rapidly up the flanks to harass the edges of the enemy force. He didn’t like Iosans, but he had two employed in his army – Eiryss would hinder the enemy ‘jacks and Wyshnalyrr augmented his own powers. The Cygnaran Ironclad smashed into the pirates while the Stormclad remained back. Meanwhile the Hunters continued to fire and manoeuvre. Once MacBain’s protective powers wore off the pirates began to fall quickly. MacBain sent the Nomad towards the Ironclad, but before it reached it Kraye flung the Stormclad at impossible speed into the mercenary ‘jack. 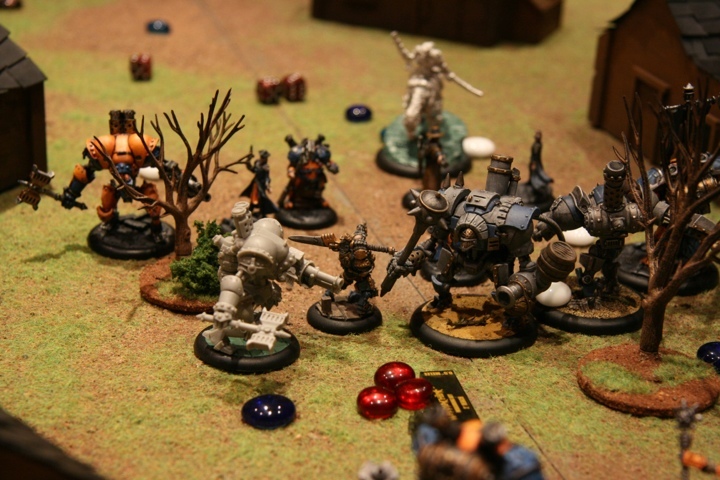 MacBain used his powers to ensure the Nomad could withstand the incoming blows from the Stormclad. In return he compelled his ‘jack to smash through the Stormclad and join the remaining pirates in pounding on the Ironclad. 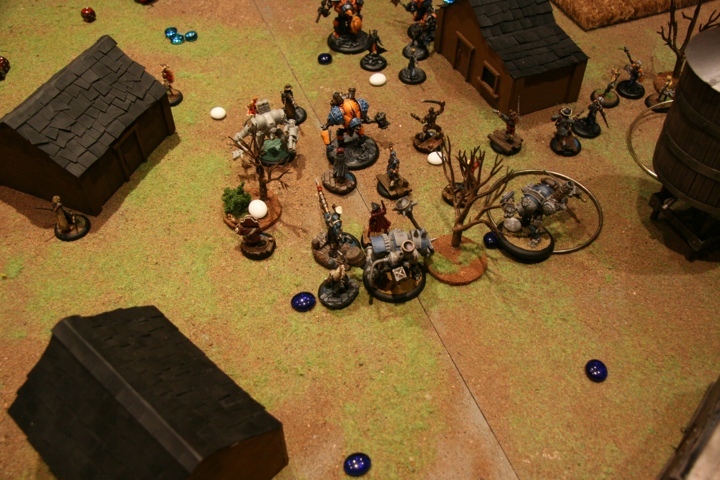 The Hunters picked out the mercenary ‘jacks at will, halting both them in a volley of fire. Things were getting desperate and there was a real danger of his position being overrun. Most of his force had been whittled away by enemy fire. Kraye strayed close to the fight and MacBain saw an opportunity. He charged the Ironclad, felling the last Cygnaran heavy. Shots rained in on him, but he kept his eye on the Cygnaran. In a lull in the shooting he began his charge towards Kraye, but just as he ran by a Hunter he narrowly failed to dodge below its blade and stumbled. In a more the was surrounded by Cygnaran guns. It might be time to consider a new paymaster!